Terrorised over 45 minutes by a second-string Swansea side, Posh will be glad they salvaged some pride before a crunch trip to MK Dons on Saturday. The under-strength Premier League side made 10 changes for their visit to Peterborough in the second round of the EFL Cup this evening (Tuesday, August 23) but they absolutely dismantled the home side with three goals before half-time. Worryingly, it was a scoreline which flattered Posh, who only made one outfield change with Ricardo Almeida Santos replacing the suspended Jack Baldwin. But there was glimmer of a consolation to take from the performance and that was a thunderbolt by substitute Leo Da Silva Lopes, the 17-year-old’s first senior goal for the club. The goal-rush was started by Jay Fulton and continued with a double by debutant Ollie McBurnie despite some heroics by Mark Tyler. Tyler was only starting because of an injury to Ben Alnwick who must have been glad that he didn’t have to face the rampant Swans. The visitors dominated the early proceedings as they attacked through wingers Nathan Dyer and Jefferson Montero. After Swansea debutant McBurnie hit a tame shot at Tyler, Montero then received a corner 20 yards out and fired a shot inches over the bar. Former Swansea loanee Gwion Edwards hit a shot over for Posh, but yet another Montero burst brought the visitors the lead. He sped past Michael Smith down the left and hit over a cross which McBurnie headed tamely at Tyler. It was a good save by the goalkeeper from close range, but the striker headed the rebound onto Fulton who in turn nodded it in from a few yards out for his first goal for the club. Posh began to see more of the ball but were caught out by a lofted through ball by Fulton which set Dyer through on goal. However, Tyler closed him down and made the save. Another lofted pass, this time with the ball spending an age in the air, and once again the offside trap failed. This time Tyler was not needed as Dyer shot wide. A few minutes later and Almeida Santos missed the ball in his own area but Tyler blocked Ki Sung-Yeung’s shot. Montero was next to have a go, jinking inside then outside of Smith but the goalkeeper somehow parried his fierce shot onto the post. But it was finally 2-0 just moments later when McBurnie also cut in from the left before curling in a shot past Alnwick. And the third goal just summed up Posh’s half. McBurnie flicked the ball over Bostwick and teed up Mike Van der Hoorn whose low shot was spilled by Tyler. McBurnie was then on hand to pick up the ball, take it away from the goalkeeper and score. 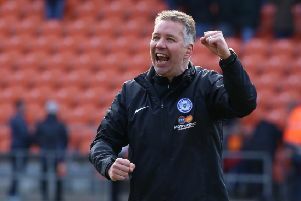 Posh started the second-half better and a Taylor backheel set Maddison running into the penalty area down the right, but his shot was saved by Kristoffer Nordfeidt. It was a much more even encounter with the match as good as over, but McBurnie spurned a chance for a debut hat-trick when he shot straight at Tyler after being found in space by Dyer. That was his last action of the night as he was replaced by Fernando Llorente, a Spanish striker who has won the World Cup and played for Sevilla, Juventus and Athletic Bilbao. Dyer then sped into the area down the left but his low shot trickled wide, while at the other end Nordfeidt parried a 25-yard Maddison effort before denying Tom Nichols with the rebound. Posh got their consolation goal 15 minutes from the end through Da Silva Lopes who smashed a shot in from 25 yards to the delight of the crowd. Llorente missed two great chances, one with his head and the other on the half volley. In between that substitute Shaquile Coulthirst foudn space inside the Swansea area and set up Nichols who smacked a shot against the post. The visitors spurned a couple of more good chances at the end but they were rewarded by their first-half masterclass with a place in the third round. Posh: Mark Tyler, Michael Smith, Ricardo Almeida Santos, Michael Bostwick, Andrew Hughes, Chris Forrester (substitute Callum Chettle, 73 minutes), Jermaine Anderson (substitute Da Silva Lopes, 58 minutes), Marcus Maddison, Paul Taylor (substitute Shaquile Coulthirst, 65 minutes), Gwion Edwards, Tom Nichols. Unused substitutes: Dion-Curtis Henry, Hayden White, Jerome Binnom-Williams, Adil Nabi, Joe Gormley. Swansea: Kristoffer Nordfeidt, Angel Rangel, Mike Van Der Hoorn, Jordi Amat (sub Federico Fernandez, 45 minutes), Neil Taylor, Jay Fulton, Leon Britton (substitute Leroy Fer, 80 minutes), Nathan Dyer, Ki Sung-Yeung, Jefferson Montero, Ollie McBurnie (substitute Fernando Llorente, 66 minutes). Unused substitutes: Gerhard Tremmel, Mo Barrow, Gylfi Sigurdsson, Kyle Naughton. Goals: Posh (Da Silva Lopes 75), Swansea (Fulton 15, McBurnie 41, 44). Cautions: Swansea - Neil Taylor (dissent).